It never fails…every Christmas season my daughter wants an ugly Christmas sweater. She just gets so much joy out of wearing them and I always have so much fun looking for those festive sweaters and sweatshirts in stores. 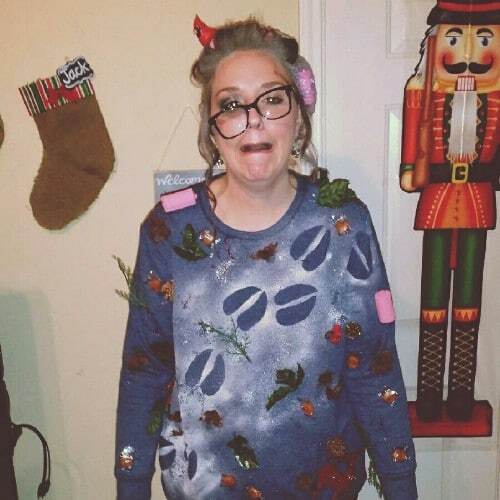 This year, I thought that maybe we would make her ugly Christmas sweater, and then I thought about all of you and your upcoming holiday parties and just how useful it would be to have a list of DIY ugly Christmas sweaters that you can make for those holiday parties or just to show your Christmas spirit. 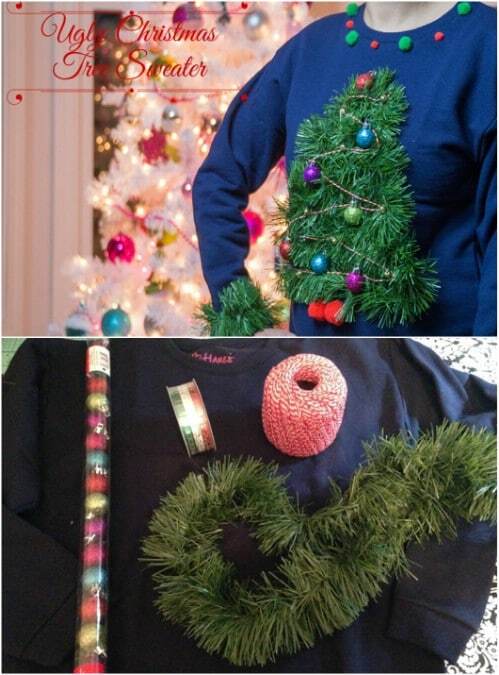 I found 15 DIY ugly Christmas sweaters that you can make in a jiffy and these are the most festive things that you have ever seen. From lighted sweaters to reindeer faces and even a few for kids, you’ll find the perfect sweater to show off your Christmas spirit this holiday season. These are all pretty easy to make and won’t take long at all, so you have time to make one for the entire family. And if you really want to get into the holiday spirit, be sure to take a look at these 10 stylish Christmas makeup ideas. So many of these sweaters can be upcycled projects. 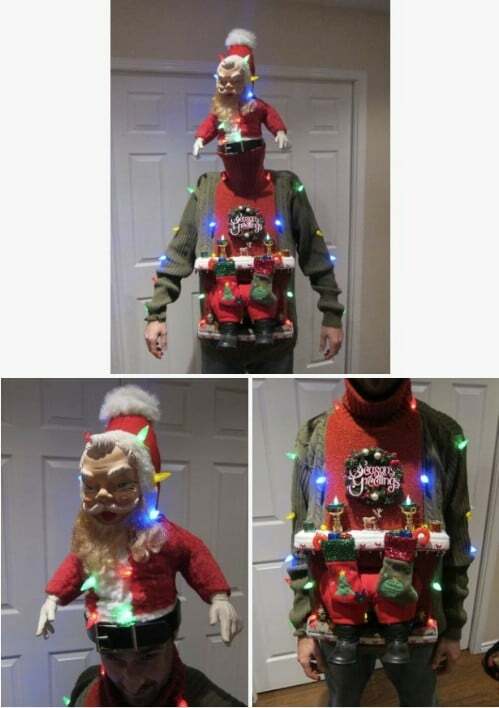 You can just take an old sweater or sweatshirt that you no longer wear or one that you find in a thrift store and add your decorations to turn it into something that would rival the Grinch’s Holiday Cheermeister Award. These are all so much fun to make and to wear and are sure to garner some attention. And, some of them aren’t even that ugly so you can wear them just about anywhere. And, if you need more ideas on how to bring in the Christmas spirit, be sure to check out these 20 beautiful Christmas inspired nail art designs. 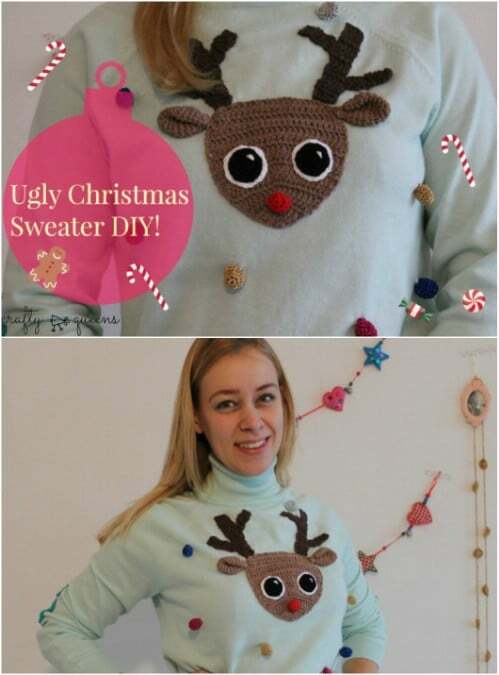 This sweater or sweatshirt is really not that ugly but if you want something that definitely shows off your holiday spirit, this is a good one to make. It’s really easy – you just need a few iron on patches and a sweatshirt that you want to make more festive. You can buy the Cricut iron ons online or in hobby stores, so just pick out a few that you like and add them…like these festive Christmas lights in gold and silver. Head out t to the Dollar Tree or Dollar Store and pick up a cheap one dollar stocking. 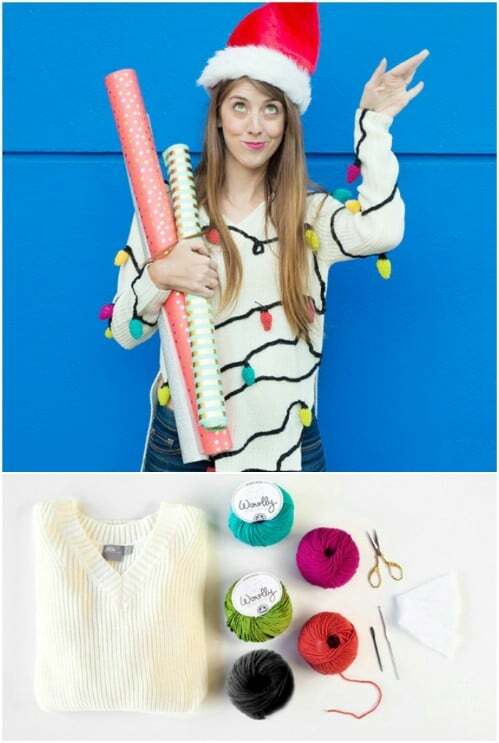 Then use that stocking to create a really festive sweater or sweatshirt. You just have to sew the stocking onto your sweater. You can also use fabric glue if you don’t plan to wear it more than once or twice – or use hot glue to hold it into place. 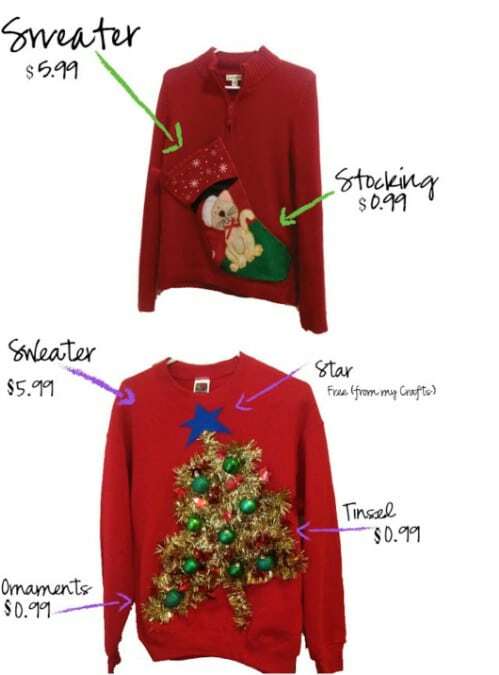 This is probably the fastest and easiest way to get yourself an ugly Christmas sweater. You really have to love a great Christmas pro hack! I don’t know if I would call this Christmas tree sweater ugly…I mean, it’s really cute and super festive. You use garland to decorate a sweater or sweatshirt for this one and it’s really cute. Just glue on the garland with hot glue and then add in all sorts of tiny ornaments or craft items to decorate your “tree”. You could even add ornaments or pom poms to the collar section and the sleeves to make it even more festive. I love this little reindeer face! 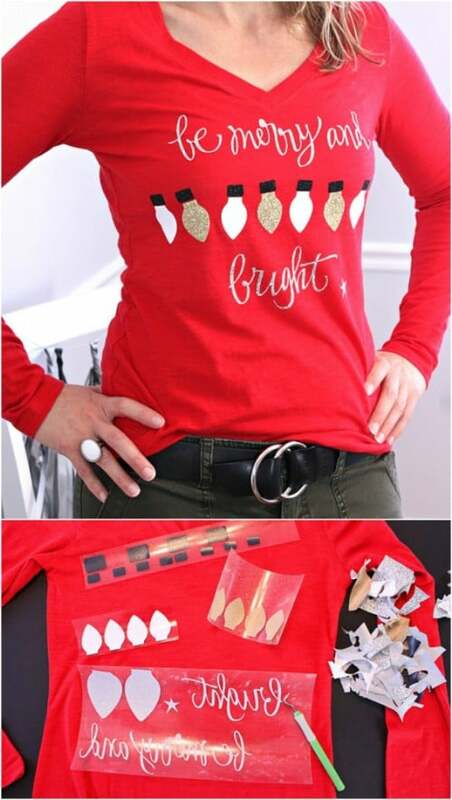 This is a great ugly Christmas sweater for kids and adults alike and it is super easy to make. You just add a crocheted applique in the shape of a reindeer face – which you can totally crochet yourself – and then decorate with any number of embellishments like glitter, candy wrappers, tiny Christmas ornaments or pom poms. 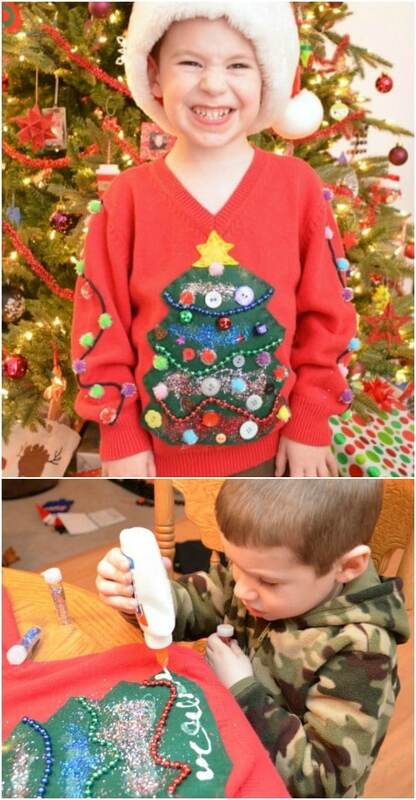 Kids really love wearing their Christmas sweaters and this DIY ugly Christmas sweater is really easy to make. You use felt to create a Christmas tree and then additional felt in different colors to decorate the tree. You can glue felt onto your sweatshirt or sweater with hot glue and it stays in place beautifully. Add jingle bells, ribbon and other decorations to really make it tacky. This lighted ugly Christmas sweater – or sweatshirt – is my favorite. Not only is it colorful, festive and tacky, but it lights up! This on costs less than $15 if you have to buy all of the materials and that includes the lights. You’ll want lights that are battery operated, otherwise you’ll have to stand near an electrical outlet all night long. Lights, plus a mini tree skirt, mini green garland and mini bulbs are all it takes to make this one. This stuck in the chimney sweater is so creative and not nearly as difficult to make as it looks. You’ll start with your sweater and then add all sorts of Christmas decorations like ribbons, ornaments, garland…anything you want to add, really. 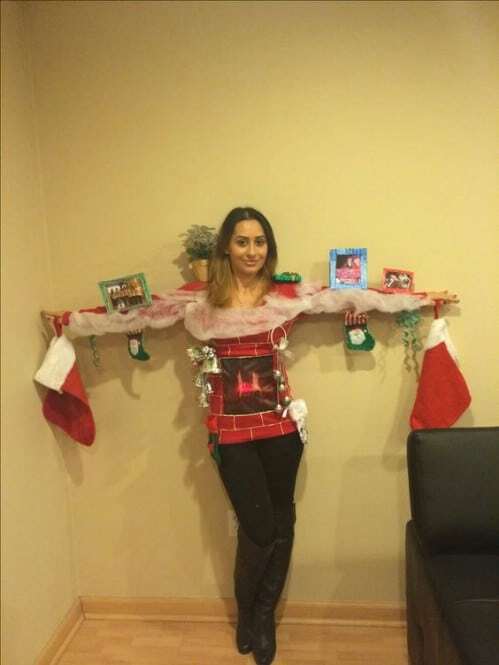 A plastic Santa and a little creative DIYing gives you the most adorable chimney sweater and the decorations just really add to the overall look. You should always check the Dollar Store for craft supplies. You never know how many festive Dollar Store decorations you can DIY. So, this one isn’t nearly as outlandish as some of the others, but this is definitely worthy of a place on the ugly Christmas sweater list. It’s a reindeer and the entire sweater is used to create it. The arms serve as antlers and the sweater body is the face. This one is pretty easy and it certainly makes a fashion statement all on its own. Plus, you don’t need that many supplies to make it. How hilarious is this sweater? It’s inspired by the song “Grandma Got Run Over By A Reindeer” and it’s almost too adorable. The little reindeer footprints are so cute and the entire sweater just has such a tacky yet cute look. You start by adding felt decorations…holly, reindeers, etc…and then use white spray snow or fabric paint to make the snow and be sure to spray over templates that are shaped like reindeer hooves. 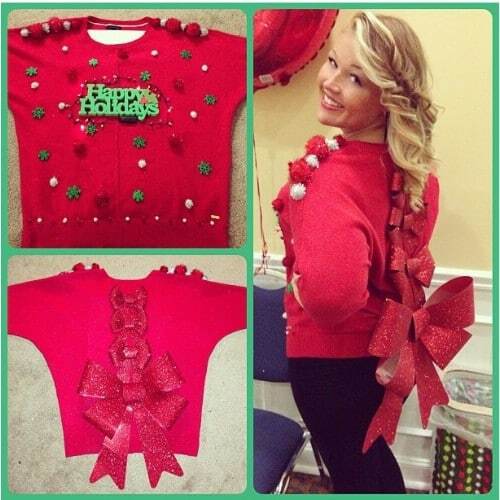 Assuming that you shop at the Dollar Tree or the discount rack, you can easily make this tacky sweater for $10 or less. You’ll need a sweater as well as some cheap garland, LED globe lights, a Rudolph headband, a Frosty and Santa headband and a few other really inexpensive Christmas decorations. You just create the scene that you want, holding all of your decorations in place with hot glue. This sweater looks like a fireplace mantel all decorated for Christmas, especially when you raise your arms and see all of the cards and decorations that are attached. The front of the sweater looks like a roaring fireplace and the sleeves create the mantel. You can even hang stockings from the ends of the sleeves and just add in whatever lights and other decorations you would put on your fireplace mantel. This maternity ugly Christmas sweater is really cute and it’s perfect for incorporating your pregnancy into your festive attire. The sweater makes a reindeer head and your baby bump is his nose! How cute is that? 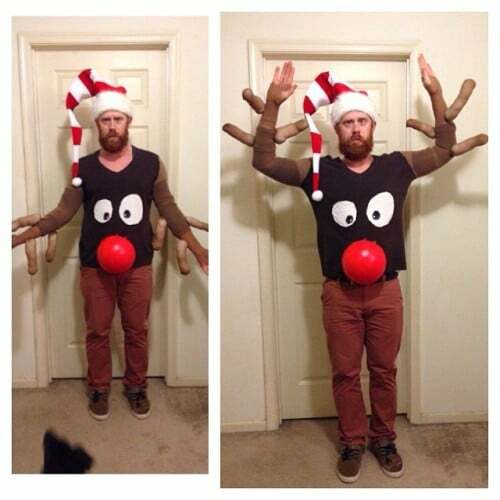 You make this with a brown t-shirt that you cut into the shape of a reindeer face and then add antlers, eyes and the red nose with buttons, stuffed satin balls and fleece. Rows of bows down the back of this sweater make it so tacky and so festive at the same time. The front is decorated with a plastic Happy Holidays sign – which you can get at the Dollar Tree – and a few ornaments or pom poms. Grab some bows at the Dollar Tree too, in different sizes and then just graduate them down the back of the sweater, ending in a huge bow at the very bottom. You can hold all of these decorations on with hot glue. 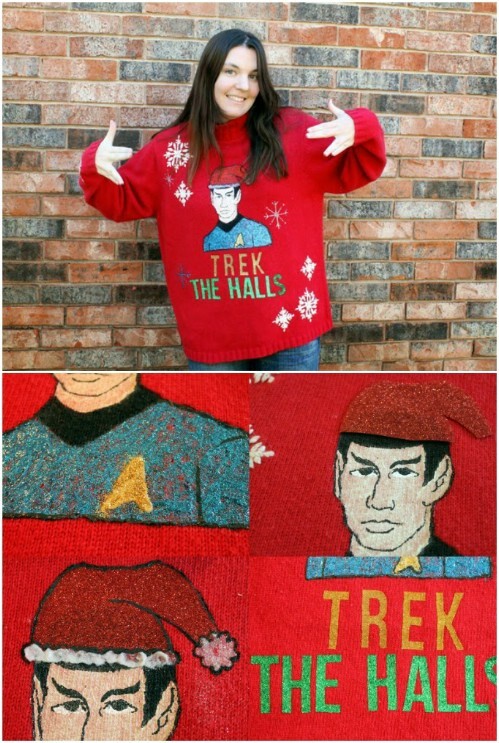 You can really “Trek The Halls” in this Star Trek inspired ugly Christmas sweater. This one is really cute and perfect for all of you Trekkies. You start with a Trek character that is made from fabric paints and then add your lettering and any embellishments like snowflakes. You can copy the image from a printed picture or freehand it. Or, you could use an iron on applique if you have one. This tacky Christmas sweater has hand crocheted lights, which are really simple to make. If you love to crochet, this is definitely the festive DIY sweater for you. You just crochet a number of Christmas lights in different colors and then join them together on your sweater with a crocheted black light string. This is a great DIY crochet sweater project for beginners.